Oh boy. It's been a overwhelming few weeks. I have had a second (and final) oophrectomy. We were going to try and save a bit of my one remaining ovary, but once the surgeon got in there and had a look, everything was just too messy to disentangle. I got to see the pictures afterwards, and I can see why she did what she chose to do. This means that I am currently going through surgical menopause. I've been given some HRT, and physically I seem to be ok. The jury is still out on where I'm going to end up mentally. I guess that one upside of adjusting my endocrine system from the outside rather than just relying on what my f---ed-up insides choose to provide is that we have the option of hitting that with a big hammer. The downside seems to be that it's only a big hammer - fine tuning seems to be a bit iffy. I'm also not too sure what to make of suddenly being infertile - it's not like I had any concrete plans to have kids, but to have the option removed. I don't know. And all this time, my tomatoes, neglected when I went to Auckland in December/January, have sprawled across the garden since I wasn't here to stake them up. I continued to neglect them, and now they're producing. Heaps. Anyone want tomatoes? I'm a bit far away to be taking the tomatoes off your hands. Were I closer, I'd offer to come by and make spaghetti sauce. Good to know you got through the surgery OK. I understand about the ambivalence. I remember how deeply it affected Paula when she had the hysterectomy, in spite of all my reassurances. I'm glad to hear that the operation was "successful", even if it did end up being a little more thorough than y'all had hoped. I hope the "adjust from outside" plan smooths things out without too many additional complications. 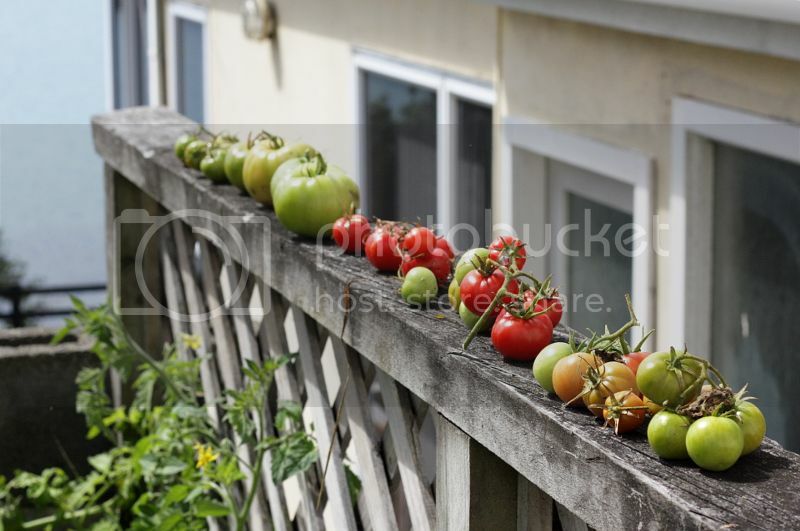 It's also good news that the garden continues to provide even when unattended -- you do seem to have a good mix of ripe and not-yet-ripe tomatoes there. Ripe vine tomatoes are definite a taste-of-summer I enjoy, and go nicely in salads.